To Cite: Akaraborworn O, Supavita C, Sangthong B, Thongkhao K, Chainiramol P, et al. Management of Open Abdomen After Trauma Laparotomy: Experience at a Level 1 Trauma Center in Thailand, Trauma Mon. 2017 ; 22(2):e27709. doi: 10.5812/traumamon.27709. Background: Open abdomen occurs most often after damage-control surgery following trauma. This condition is a temporary abdominal closure of the abdominal cavity which is left open. Objectives: This study aims to describe the experience and management in open abdomen trauma patients at a level 1 trauma center in Thailand. Patients and Methods: A retrospective review was performed of all adult trauma patients who had open abdomen after laparotomy between January 2011 and December 2012. Patients who had open abdomen but did not survive in the operating room were excluded. The data were collected from the trauma registry and medical records. 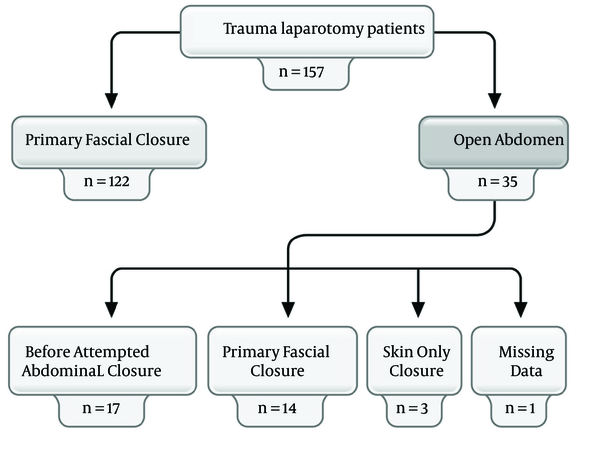 Results: After 157 trauma laparotomies, 35 (22%) were open abdomen cases with an average injury severity score was 35. Ninety-four percent of open abdomens occurred after damage-control surgery. Temporary vacuum-assisted closure was applied in all patients. The fascial closure rate was 40%. In patients who failed to achieve a standard fascial closure, the skin closure technique alone was used. Deep surgical site infection was the most common complication after the abdominal cavities were closed. No enterocutaneous fistulae were reported. Conclusions: Vacuum-assisted abdominal closure is a good technique for temporary abdominal closure. In patients who are unable to achieve fascial closure, skin closure alone is safe. Damage-control surgery is widely used for multiple-trauma patients. The concept of damage-control surgery is based on the knowledge that severe trauma patients experience physiologic disturbances, such as metabolic acidosis, hypothermia, and coagulopathy (1). These patients should undergo damage-control surgery to control bleeding and contamination, and should then return to the critical care unit to restore the physiology before returning for definitive surgery. After damage-control surgery, the abdominal cavity is left open, with a temporary abdominal closure. Techniques for such closures have been developed over time, and several have been proven safe (2, 3). Following the creation of open abdomen, successful completion occurs with fascial closure, allowing the patient to be discharged safely without complications or ventral hernias. The standard practice at our institution is vacuum-assisted abdominal closure for all damage-control laparotomies at the first operation. An attempt is then made to achieve standard fascial closure. If this is not successful by the third operation, patients undergo skin closure alone. Patients with planned ventral hernias from skin closure alone undergo abdominal wall reconstruction 6 months after the injury. We have declined to use a complex abdominal wall reconstruction in an acute setting. The purpose of this study is to report the techniques and outcomes of management of open abdomen at Songklanagarind hospital, a level 1 trauma center and university hospital at Prince of Songkla University, Thailand. Open abdomen was defined as an open abdominal cavity after exploratory laparotomy that required a temporary abdominal closure. Temporary abdominal closure was defined as a method of temporarily closing the abdominal cavity with a planned re-laparotomy. Avacuum-assisted abdominal closure is a temporary method that uses a nonadhesive layer, such as a plastic bag, to cover the bowel, which is then covered with gauze or towels. The wound is drained by 2 tubes connected to wall suction at 100mmHg. At our institution, the outermost tube was covered with 3MTM IobanTM. A definitive fascial closure was defined as an abdominal wall that was completely sutured together. Skin-only closure is a technique of suturing only the skin layer, which leads to a planned ventral hernia. This was a retrospective review. The data were taken from the medical records and trauma registry. All trauma patients over the age of 15 years who underwent open abdomen from January 2011 to December 2012 were included. Excluded patients were those who died in the operating room, even if they had an open abdomen and temporary abdominal closure. The data collected were demographic information, indication for open abdomen, sustained injuries, temporary abdominal closure methods, fascial closure rate, and complications. During the 2-year study period, there were 157 laparotomy procedures in trauma patients. Open abdomen occurred in 35 (22%) of these patients. The patient demographics are shown in Table 1. Thirty-three patients (94%) had open abdomen due to damage-control surgery. One patient (3%) had open abdomen due to equivocal viability of the bowel, and one (3%) had open abdomen for treatment of intra-abdominal hypertension. The sustained injuries are listed in Table 2. All of the patients had temporary vacuum-assisted abdominal closure after the first operation. Seventeen patients (49%) died during the damage-control surgery and temporary abdominal closure. In those 17 patients, primary fascial closure was not attempted. Eighteen patients survived to undergo abdominal cavity closure. Of these, 14 (40%) achieved definitive fascial closure and 3 (9%) had abdominal wall closure with the skin-only technique. One patient had missing data in the operative notes concerning the details of the abdominal closure. The average time from injury to abdominal cavity closure was 2.4 ± 1.58 days (Figure 1). Of the 18 patients with abdominal closure, either definitive fascial closure or skin-only closure, 9 (50%) had at least one intra-abdominal complication. Deep surgical site infection was the most common complication, occurring in 6 patients (17%), followed by intra-abdominal collection, which occurred in 4 patients (11%). The other complications are shown in Table 3. Serious complications of open abdomen, such as enterocutaneous fistula or enteroatmospheric fistula, did not occur. Among the 14 patients who had fascial closure, 3 later developed giant ventral hernias. Most of these patients underwent abdominal wall debridement after deep surgical site infection, and closure of the abdominal wall was not possible. Of the 35 patients with open abdomen, 16 survived and were discharged from the hospital. The mortality rate was 54%. The reported primary fascial closure rate varies from 65% to 100% in the literature (4-6). The closure rate in our study was lower. A possible reason for this was that our patients were more severely injured. Dubose et al. (5) reported that an injury severity score (ISS) of > 15 was associated with failure of primary fascial closure. In their study, the mean ISS was 28.2; while the mean ISS in our study was 35 and 94% of our patients had an ISS of > 15. Burlew et al. (6) reported a technique for achieving a 100% fascial closure rate, using vacuum-assisted abdominal closure plus interrupted sutures of the fascia. This technique required bringing the patient back to the operating room several times, and 7 days were required to close the abdomen. Our technique did not use interrupted suturing of the fascia, and the mean time from the first laparotomy to definitive closure in our study was 2.4 days. The strategy for closing the abdomen at our institute included a concern for the time required for the closure, and we intended to achieve abdominal cavity closure as soon as possible. Sometimes, the skin-only closure technique was chosen for closing the abdominal cavity, which allowed the patients to recover from the injury. The patients then underwent delayed abdominal wall reconstruction within the next 6 months. Miller et al. (4) reported that complications increased when the time for abdominal closure was prolonged. The rate of intra-abdominal complications in our study was 50%, which was higher than other studies that reported complication rates in the range of 20% - 40%. Although 34% of our patients had hollow viscus injuries, we did not observe an enteric fistula, which is considered one of the most serious complications in this group of patients (4-6). A study in our institute from 2007 to 2008 (7) reported a fascial closure rate of approximately 40%, which was the same as in this study. In the current study, vacuum-assisted abdominal closure was the only method used, whereas the previous study used vacuumed-assisted abdominal closure in only 93% of cases. Skin-only closure was the only alternative method used for open abdominal cavities in patients who could not have a definitive fascial closure. Bipedicle skin flaps and split-thickness skin grafts were not used in our study. Intra-abdominal complications were the same (50%), but in the present study, we did not encounter an enterocutaneous fistula. Vacuum-assisted abdominal closure is a safe method for temporary abdominal closure. Skin-only closure is a good and safe alternative method for patients who are unable to have a primary fascial closure. Enterocutaneous fistula was not reported with these methods in our study. We thank Mr. Glenn Shingledecker for language consultation. Authors’ Contribution: Osaree Akaraborworn: proposal-writing, manuscript development; Chomphunut Supavita: data collection; Burapat Sangthong: co-writer of the manuscript; Komet Thongkhao: co-writer of the manuscript; Pratthana Chainiramol: data collection; Khanitta Kaewsaengrueang: data analysis.